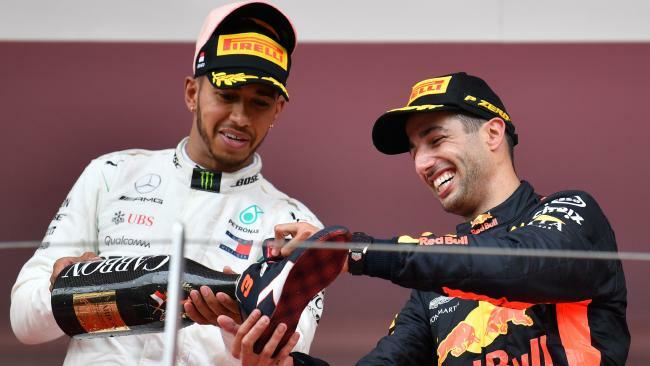 Lewis Hamilton pours Daniel Ricciardo a shoey. "But that is unlikely here and l don't think that is going to happen. And if you look at Ferrari, I imagine Kimi will want to continue - he is driving really well this year and doesn't seem to be ageing." 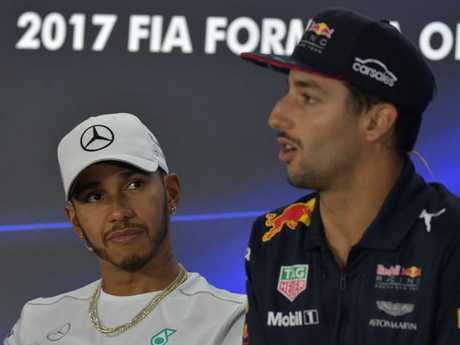 Hamilton (L) believes Ricciardo will stay at Red Bull. "From what l hear, he has a teammate who is making a lot more money than him, and yet he is more consistent at keeping the car together and more often than not pulling it through," said Hamilton. "It's important in a team you are valued at what you a worth." Watch the moment Daniel Ricciardo returned to the Red Bull Energy Station to cheers and high-fives before he embraced his family.